I’ve spent most of my life trying to feel comfortable in my own skin - trying to love my body the same way I love my mind and my spirit. I’ve battled with bulimia and while I’ve since learned to embrace my quirks and imperfections, I still struggle with the need to somehow be better, the desire that I should somehow be more. As women, we are bombarded with the ideals of modern media and Glennon Doyle’s book, Carry On, Warrior, perfectly puts into words how young girls are taught to act and think a certain way. If you want to be popular, you must be “thin and beautiful”, but more importantly – you must be desired by men. As we age, we learn to associate our worth with how other people view us. We become “objects” of other people’s affections and we desperately search for that one person who will tell us that we are “good enough”. When I read Carry On, Warrior, tears streamed down my face because I saw so much of myself in Glennon Doyle’s story – a young girl who so desperately wanted to be told she was “enough” because at the time, she never knew she had the option to find happiness alone. Carry On, Warrior shows the strength that each one of us has buried deep inside – the power to live life on our OWN TERMS and realize our true potential independent of anyone else. We were meant to SHINE - to share our gifts and talents with the world without having to wonder every single day if we are pretty enough, thin enough or desirable enough to make a difference. Glennon Doyle is vulnerable and honest and she shares her story without apology and without the mask of female expectations. She is REAL and it’s one of the most refreshing stories of female independence I have read in a very long time. If you’ve ever asked yourself – is this it? Is this all my life is going to be? Then I highly recommend sitting down with a hot cup of tea and indulging in this beautiful story of one women’s courage and determination to find her true self and what it means to wrestle with love, hurt, addiction, vulnerability, intimacy, and grace and come out of the other side stronger than ever. 2-DAY HALLOWEEN FLASH SALE - limited time offer! Rather than indulging in sugary treats this year, why not treat yourself to a Home Essentials Kit from doTERRA instead? Here’s the bottom line, essential oils give you a simple way to take care of daily ailments without having to run to the pharmacy; things like feeling run down, struggling with sleep, tummy troubles, congestion, tension, scrapes, bites, sore muscles, and even weight management. I use natural remedies for pretty much everything and I can assure you that doTERRA sells the PUREST essential oils on the market. I’ve tried A LOT of health products out there, but doTERRA is the company I recommend to my clients because their products really are that good! So, if you’ve been listening to all the “BUZZ” around essential oils and you're ready to get in on the action - TODAY IS THE DAY! Not only does the Home Essentials Kit give you everything you need to start a new "natural" health regiment, but you also get to take advantage of these MASSIVE BONUSES & SAVINGS until October 31st, 2017. CLICK HERE TO PURCHASE YOUR KIT TODAY! If you bought all these products separately, it would cost you $629, but until Tuesday you only pay $330. That’s almost $300 in savings!!! Plus you’ll receive 25% off all future purchases for an ENTIRE YEAR! I told you today was a good day to get started! So what's in your kit and how do you use it? A small, user-friendly diffuser that delivers health-promoting benefits to your family and home. It has a relaxing mist and soft white ambient light. This diffuser covers 330 square feet and has three timed settings (1, 2, and 4 hours) allowing you to customize the release of essential oils into the air. This is an easy diffuser to use -- perfect for home or office use. Frankincense is commonly referred to as the ‘king of oils’ for very good reason. It is a holy oil (referred to in the Bible) and in ancient times was used in sacrificial ceremonies. The French have used this oil over the centuries for medicinal purposes to ease symptoms of asthma, depression, and ulcers. It has a warm, spicy aroma and It’s the go-to oil when you don’t know what else to use. When in doubt, go with Frank! NOTE: This product retails for $93.00 because the Boswellia tree is only grown in a handful of countries. The fact that a 15ml bottle is included in this kit is AMAZEBALLS! Lavender is often considered a must-have oil to keep on hand due to its versatile uses; it contains calming and relaxing properties that promote peaceful sleep and can ease feelings of stress and tension. * In ancient times, the Egyptians and Romans used Lavender for bathing, relaxation, cooking, and as a perfume. Cooling, fresh and invigorating! It’s great for headache relief and supporting the digestive system. * It’s also delicious in smoothies, brownies and all sorts of treats! Other uses for peppermint oil include: relieving symptoms of asthma, chronic fatigue, congestion, fevers, hot flashes, nausea, and vomiting. Tea Tree oil is best known for its purifying qualities, which makes it useful for cleansing the skin and home surfaces, purifying the air, and promoting healthy immune function. * The leaves of the melaleuca tree have been used for centuries by Indigenous Peoples to heal cuts, wounds and skin infections; and the French use it to treat athlete’s foot, bronchitis, colds, coughs, diarrhea, and the flu. Oregano is one of the most potent and powerful essential oils and has been used for centuries in traditional health practices for its cleansing and immune-boosting properties. * Known as doTERRA’s top shelf immune support oil, Oregano acts as a powerful cleansing agent, and offers powerful antioxidants*—extending its uses far beyond kitchen cooking. This blend provides a natural and effective alternative for immune support. * On Guard protects against environmental and seasonal threats and can be taken internally on a daily basis to maintain healthy immune function and to support healthy cardiovascular function. * It can also be used on surfaces throughout the home as a non-toxic cleaner. When diffused, doTERRA On Guard helps purify the air and can be very energizing and uplifting. As the name suggests, DigestZen is a wonderful companion to aid in the digestion of food, soothe occasional upset stomachs, and reduce uncomfortable gas and bloating. * It’s known as the tummy tamer and may also reduce symptoms of motion sickness. Common uses include bloating, constipation, abdominal cramps, food poisoning, parasites, diarrhea, flatulence or vomiting. doTERRA's Breathe is a remarkable blend of essential oils including Laurel Leaf, Peppermint, Eucalyptus, Melaleuca, Lemon, Cardamom, Ravintsara, and Ravensara. It maintains feelings of clear airways and easy breathing while minimising the effects of seasonal threats. Breathe can be applied topically to the chest, back, bottoms of feet, or diffused at nighttime to calm the senses and promote a restful sleep. This is my fitness favorite!! Deep Blue offers a soothing solution for sore muscles, joint pain, and head and neck tension. Apply 1-2 drops to the problem area and massage for 2-3 minutes. It smells similar (but better) than A535 and it acts in the same way – except its completely natural! What's not to love about that? 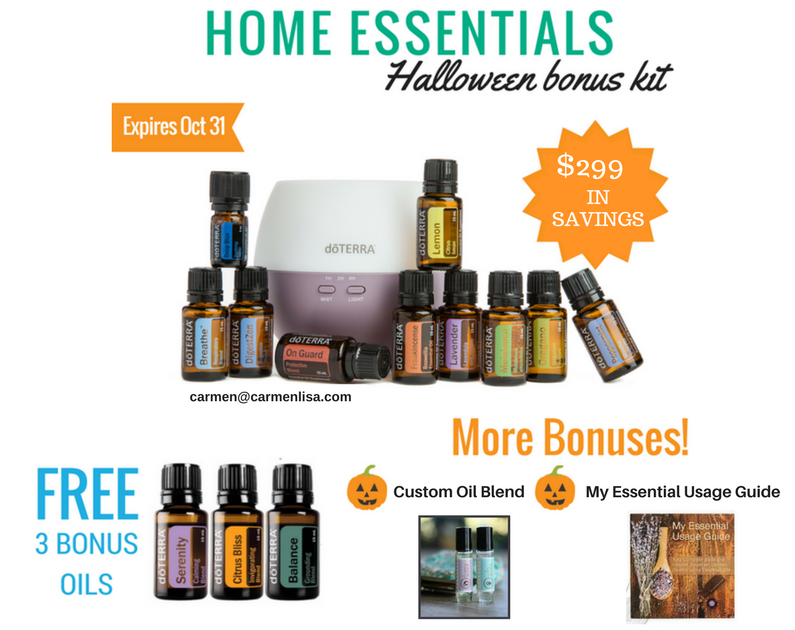 When you purchase the Home Essentials Kit by October 31st, you also get these THREE Bonus Oils for FREE. If you bought them retail, they would cost $110.65, but today you won’t pay a dime! This blend of citrus oils and vanilla smells like a delicious creamsicle and inspires feelings of creativity and contentment. A favourite for diffusing throughout the house or in your office! Take a drop in your hands, rub together and breathe deeply for a 3pm pick me up! This relaxing blend of oils is amazing for relieving stress, anxiety, and improving sleep. * Apply behind the ears (you have a high concentration of blood vessel's there), chest, under your nose or on the back of your neck. Diffuse or put a couple drops in your hands at night and inhale. Personally, I use Serenity every night before I go to bed and I sleep like a BABY (a happy, non-crying, baby of course). I'll also create a custom essential oil roller ball blend for you to address your specific health goals AND gift you an essential oils usage guide so you'll be able to easily figure out what oils to use when things come up!! AM i! wHERE DO i SIGN UP? Click on the button above and you'll be redirected to my website. Once you are there, click the Join & Save button on the top and follow the prompts. Make sure you sign up as a Wholesale Customer or Wellness Advocate to receive 25% off your products for A WHOLE YEAR! 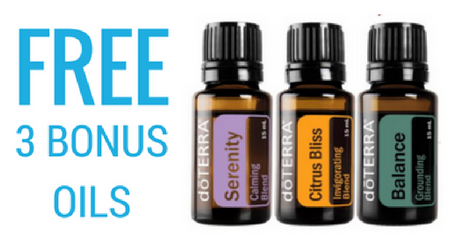 IMPORTANT: Once you add the "Home Essentials Kit" to your cart the 3 Bonus Oils will automatically be added FOR FREE! After you check-out, I'll be in touch and we'll discuss your needs so I can create your custom roller blend! I'll send you the blend & your essential oil usage guide in a separate package in the mail. If you have questions or find it difficult to order the Home Essentials Kit on your own, send me an email at carmen@carmenlisa.com. I'll give you a call and we can work out the details together. Disclosure: The products recommended are not intended to diagnose, treat, cure or prevent any illness or disease, nor is it intended to replace proper medical care. When it comes to weight loss – Halloween candy is the devil in disguise. In theory, the tiny snacks appear great for portion control – they’re only 60 calories for two bites of delicious, mouth-watering, chocolate goodness, but let me ask you this - how many times have you been able to stop at just one when there’s a giant bowl of them sitting next you? 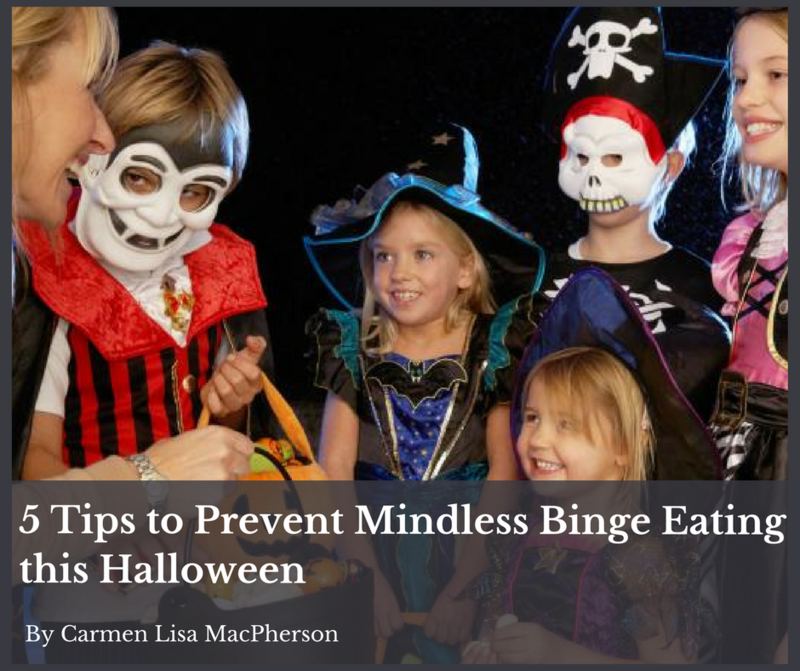 Your will power is simply no match for the temptation you will feel by having them in your house so I recommend employing one of the following strategies to keep yourself from binge eating this Halloween. ​Many of us use Halloween as an excuse to eat WAY too many sweets. We buy our favourite treats (in ridiculous quantities I might add) and feel the need to eat the ones left over at the end of the night. I think it’s fair to say that most of us feel bad about “wasting food”, but believe me when I say this – chips, chocolate and candy are not “food” and your body is much better off without them. The good news is that when you buy candy you DON'T like, you’re much more willing to part with it. So, if you’re a chocolate fiend, go with chips. If you are a salt-a-holic, buy candy. ​You don’t HAVE to give out candy. Yes, people might think your weird handing out Halloween pencils and colouring books, but so what? If someone comes to my door looking for a “trick or treat” then I get to decide what that treat is going to be. Now I don’t recommend handing out apples (that might get your house egged), but the dollar store has all sorts of Halloween inspired “treats”. You can hand out erasers, pencils, stickers, colouring books……. really anything with a Halloween inspired theme will do. In the past, I’ve made little treat bags with pencils, erasers and mini notepads and no one knew what was inside them until they got home. Who knows, maybe the kids enjoyed having something “different” in their bags and if they didn’t…. well let’s just say I didn’t lose any sleep over it. The chances of you buying the perfect amount of candy is slim to none so you need to know what you’re going to do with all that candy once the night is over. Not everyone is trying to lose weight or banish their sugar cravings so you get double the benefit. You keep your waist line in check AND you earn the love and affection of all your coworkers. ​It’s a win-win for everyone. If you only get a handful of kids each year, don’t buy a box of 50 chocolate bars, OK? ​Go to the bulk barn and pick out treats individually instead. On the flip side, if you tend to get a lot of kids, only buy one box of candy and turn out the lights when the candy runs out. You’re be saving pounds and dollars! Again. You don’t HAVE to give out candy. If you don’t think you can handle having bowls of chips and candy in your house this Halloween, don’t buy it at all. Halloween is not a national holiday, in fact, it’s one of the least celebrated in the world. Yes, in North America we LOVE our junk food, but most countries don’t partake in these festivities. Turn off your lights, cozy up by the fire and read a good book instead. I’ve done this many times, and again, I’ve never lost any sleep over the fact that I wasn’t giving children pre-diabetes (GASP! Yes, I just said that). Don’t let Halloween sabotage your weight loss efforts! So how are you going to avoid binge eating on candy this Halloween? 10 EASY Breakfast Recipes to Minimize Nighttime Cravings. At the time, I didn’t know the human body was designed to store fat in times of famine and I had NO idea that by cutting back to 1000 calories, I was actually slowing down my metabolism and making it even harder for me to lose weight. It wasn’t until I started reading books on nutrition, biochemistry, and human anatomy that I started to figure things out. I decided that instead of waiting until I was starving to eat (and then eating WAY too much food in the evenings), I would shift my focus to eating more during the day so I wouldn’t feel so hungry and tempted to “cheat” in the evenings. Breakfast really is the most important meal of the day. Seriously! If you can make eating a healthy breakfast a regular habit and part of your daily routine you'll be one step closer to reaching your weight loss goals. Here are 10 EASY breakfast meals that are loaded with nutrients to keep your weight loss goals on track. Hard or soft-boiled eggs make anything feel like breakfast, including a big bowl of spinach or kale. Add some sliced avocado and a handful of sunflower seeds, and you've got a veg-heavy breakfast that will keep you feeling full for hours. Do you love oatmeal in the morning? Why not try a warm baked sweet potato instead? Like your bowl of oats, it's loaded with fibre and complex carbs. Best of all, you can add any toppings you want. Go savoury with sauteed greens, onions and mushrooms, or stay on the sweeter side with a dollop of plain yogurt and chopped nuts or seeds. ​Why not swap your usual muffin or breakfast bar for high-fibre veggies? ​Eat raw vegetables with dip (try broccoli, cucumber, carrots, peppers and cherry tomatoes). Or try roasted Brussel sprouts and asparagus—cook them up the night before and eat them cold (they're just as good). 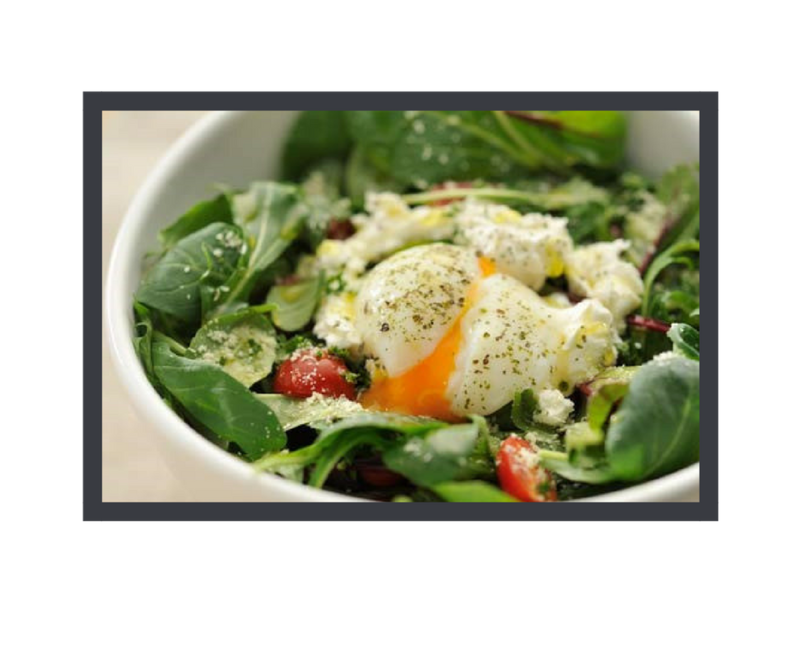 Pair your veggies with a boiled egg and some nuts and you’ll be feeling super energized come lunch time. ​Instead of scrambled eggs with a measly handful of spinach or tomatoes, try reversing the ratio. Sauté loads of vegetables in some coconut oil (any combo works, but spinach, mushrooms, peppers, carrots, and butternut squash is super delicious). At the very end, add an egg or two to bring it all together. ​Crack your egg into a hollowed-out tomato half, half of a bell pepper, or even a big portobello mushroom and broil on high until set. Top with a little Parmesan cheese and enjoy. It looks super fancy and it tastes delicious! What's that? You're too lazy to make breakfast? Yeah, I've been there! ​Next time, try eating your dinner leftovers (which is loaded with healthy goodness, right?) Because even a cold slice of spinach and broccoli pizza is better than a crappy granola bar or a sugar-filled bowl of cereal. ​Mashed avocado on bread? You can do better than that! Load up your toast with mashed avocado, raw sauerkraut, grated beet, and roasted cauliflower. Drizzle with tahini, or a thick slice of juicy tomato and creamy mozzarella. Delish! You can never go wrong with scrambled eggs, salsa, and some cheese folded into a whole wheat or brown rice tortilla. But if you stopped at that, you'd be missing out on a prime opportunity to add a serving or two of vegetables like sautéed bell pepper strips, caramelized onion, or baby spinach. Instead of fruit or chocolate chips, fold shredded carrots, zucchini, yellow squash, or beets into your pancake batter. Or go full-on savory with sautéed spinach or mushrooms, and top your pancakes with butter, coconut oil, or yogurt rather than the usual maple syrup. 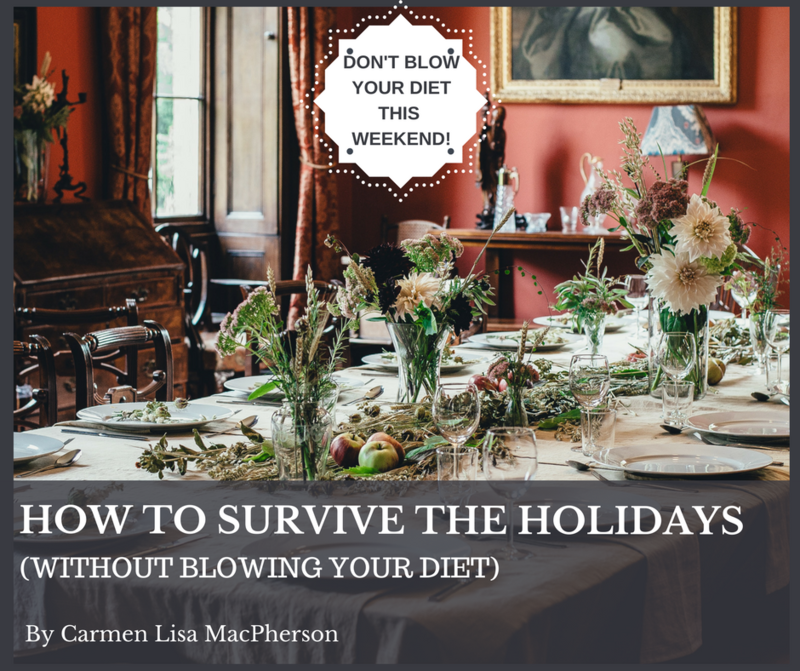 How to SURVIVE THE Holidays Without Blowing Your Diet! ​It’s that time of year again, when family and friends gather together to enjoy traditional meals and cheers the occasion with wine and beer. That’s right, it’s Thanksgiving in Canada! And I wanted to post a few helpful tips to keep you from blowing your diet this weekend! I totally get the temptation, I really do. Holidays can be challenging even in the best circumstances (we all have that one family member that leads us to drink, right? ), but when your trying to reach a weight loss goal, it means this type of get-together is even more challenging. Do not, I repeat DO NOT show up at the party without something “diet approved” in your hands. It’s not to say that you can’t eat what’s being prepared, but you don’t want to sit down and find yourself staring at a table full of food you can’t eat. I always bring a dish or two that I know I can eat and others will enjoy as well. If you’re concerned the host will be offended, give them a call the day before and ask if you can bring something. Just be honest. Let them know that you're working towards a goal and you want to stay accountant. Honestly, I have yet to show up to a party with food in my hands and have the host be upset with me. Most people appreciate the gesture. Just because it’s a holiday doesn’t mean you should eat 2-3 times more than your body needs. We’ve all done it, and you know exactly how you feel afterwards – you feel like a big stuffed, bloated pig and you hate yourself for it, right? Fill half your plate with raw and/or cooked vegetables. (both the size of your palm). ​(for example, butter on your veggies). ​​Skip the dinner roll, gravy and all the other fixings that will just make you feel bloated. Trust me, you’ll thank me when everyone else looks uncomfortable, bloated and tired and you’re sitting all tall and empowered beside them. There’s always going to be that one “crab in the bucket” so the faster you learn how to deal with the comments, the better. Do you want to know what a treat is? Here’s the thing, some people can’t handle watching other people succeed. It brings light to the fact that they haven’t been able to take control of their own life and it makes them feel uncomfortable. Just smile and say, “Thank you. Everything looks delicious, but I’m good.” Then immediately switch the conversation to, LITERALLY ANYTHING, besides what you’re eating. [HOT TIP] Ask them about their kids or pets. People LOVE IT when you show interest in this area of their life! If you want to have 1 or 2 drinks with dinner, that’s acceptable, but don’t finish the bottle, OK? the excess calories and I don’t know about you, but ​I’m not in the habit of going for a run after I attend a social gathering. I also recommend drinking a glass of water for every glass of alcohol you consume. ​Alcohol + Dehydration = Hunger which leads to…. oh, I don’t know….2 pieces of cake! Let’s not go there, OK? You made the commitment to become the best version of yourself, so don’t welsh on your promise, OK? 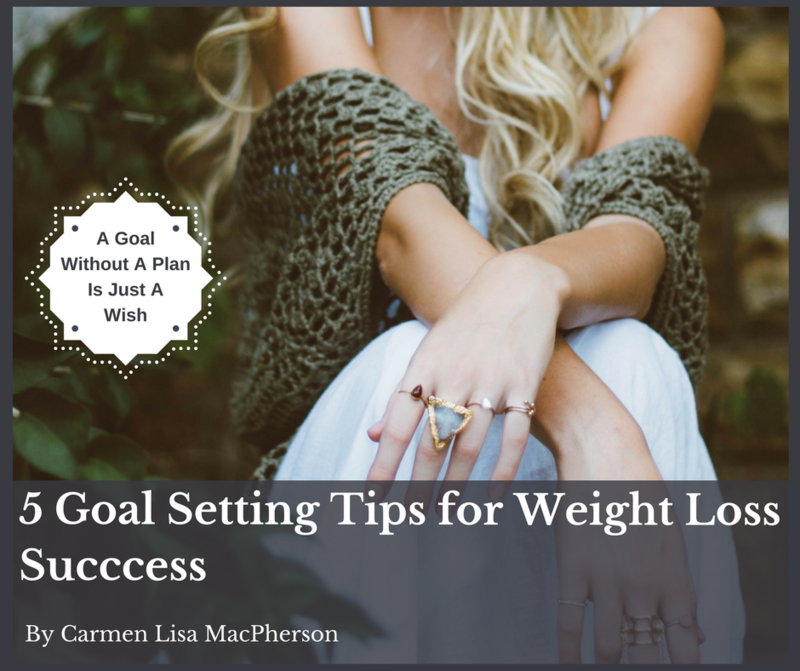 5 Goal Setting Tips for Weight Loss Success! As nice as this notion is; it doesn’t sound like this person is going to lose weight anytime soon, right? Clearly this person thinks it would be “nice” to lose weight, but they are relying on the fact that something will happen in the future to make that happen. What is that something? No one knows. So, what are the chances this person will actually reach their weight loss goal? I think it’s safe to say, slim to none. This statement holds a little more weight (no pun intended) because at least she is contemplating weight loss and visualizing herself actually achieving it, but it’s still not enough to facilitate change. When we dream of being thinner, we are still stuck in our heads. We aren’t actually doing anything to turn that dream into reality. Unless we take action our dreams will never be anything more than a nice picture in our minds. Can you feel the power in this statement? This person sounds WAY MORE committed to making it happen because when we state something as our goal, we are telling ourselves and the universe that this is something we are going after. We’ve decided we want it and we’re ready to do whatever it takes, to make it happen. This person has the best chance of reaching their weight loss goal, don’t you think? So, what have you been telling yourself? Are you hoping and dreaming you’ll lose weight or have you made it your GOAL to lose weight? If you’re ready to make weight loss your goal, then this blog post is for you. I'm going to teach you the step-by-step system I use with my clients, to help them create goals that not only motivate them, but also ensures their success. Clearly, having a goal to lose weight is much more powerful than “hoping” or“dreaming” about it, but it’s still not enough to get you to the finish line. ​If you want to set yourself up for success, you need to create a SMART goal. What's a SMART goal, you ask? It’s a goal that is Specific, Measurable, Attainable, Relevant and Timed. And how do you make a SMART goal? Well, grab a pen paper and let’s make yours right now! You want to avoid making vague or general goals. It's not enough to say you want to “eat better” or “lose weight”, you need to be specific in what you actually want to achieve. 2. Why are you creating this goal? How will it make you feel? 4. When will you achieve this goal? When I’m making goals, I find it helpful to turn my goals into future statements. This way it feels like the transformation has already happened when I read it. I always spend time picturing myself at the finish line (this is where dreaming can be helpful). Let’s use my client Sarah as an example. Sarah is 190 lbs and has never participated in exercise. She has a very stressful job with long hours and doesn’t have much energy at the end of the day. She’s tired of feeling tired all the time and doesn’t feel good about herself when she looks in the mirror. She thinks losing weight will help her fell better. ​Much better than “lose weight”, right? Once you know exactly what you want, it's easier to plan out how you are going to get there. You have to be able to measure your success. In other words, you need a way to track your progress. For Sarah’s goal, we have 3 things we can track – her weight, the number of days she runs and strength trains, and what she eats. This is why having a SPECIFIC goal is so important. You can’t measure a generic statement like “lose weight”. Because Sarah planned to reach her goal using a whole foods diet, I encouraged her to commit to writing in a food journal every day so she could track how well she followed the diet. That way if her weight loss stopped, she could refer to her old food logs to identify the problem. I also encouraged her to keep track of her exercise schedule. I gave her a simple activity chart where she could check off the days she ran vs strength trained that week. Finally, because she wanted to lose 40 lbs, so agreed to weighing herself on a weekly basis to see if she was on track. She also made a mini-goal of losing 3 lbs a week to keep her motivated while she waited to reach her ultimate goal. It’s important that you make your goal attainable. Setting a goal to weigh 120 lbs when you are 5 feet 8 inches is not smart goal setting; neither is hoping to lose 40 lbs in 4 weeks. In short, make sure your goals are realistic and you know it’s possible to achieve in the time frame you allotted. 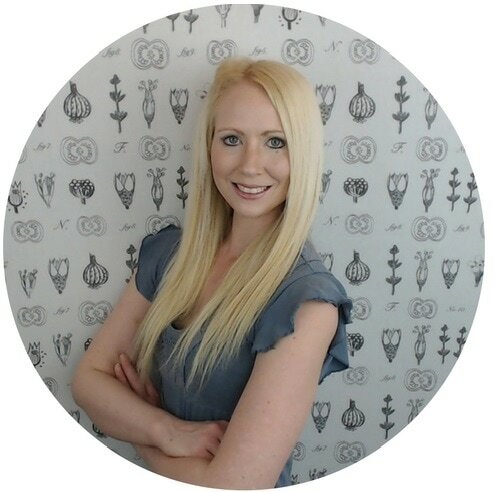 In Sarah’s case, I asked if she felt that her goal was attainable and she admitted that she felt overwhelmed at the thought of tracking her food and exercise every day. She also wasn’t sure she could commit to exercising 6 days a week right off the bat. Sarah decided to change her goal so it would be more realistic and attainable for her. Her new goal was still challenging, but it didn’t make her feel overwhelmed. ​Sarah made a great decision to adjust her goal based on her abilities and confidence. Is YOUR goal realistic and attainable for you? ​A goal should have meaning for you and be relevant to your abilities and interests. When I asked Sarah if her goal showcased the things she wanted AND enjoyed, she was conflicted. ​She made another change to her goal. Does ​YOUR​ goal feel relevant? Will it be something you enjoy? ​(If not, go back and make some adjustments). A goal needs to be time-bound. Meaning you must have a target date for completion. Sarah knows a realistic rate of weight loss for this particular diet plan is 1 to 2lbs a week and she wants to lose 25lbs. Therefore, if she lost 2lbs a week, it would take her a little over 3 months to reach her goal. Sarah remembered that her goal needs to be attainable and realistic and she has a very stressful job and busy schedule so she wanted to give herself a little bit of wiggle room to reach her goal. Sarah is SMART. ​Sarah is really motivated now and she’s ready to finally put this plan into action. The SMART goal she created makes sense to her because it was made specifically for her wants and needs. Is YOUR target date realistic? Do you KNOW you can achieve it in that time frame? ​(If not, make some more changes). Once you are finished creating your weight loss goal, I encourage you to write it down on an index card and carry it around with you. Read it whenever you need motivation; like first thing in the morning and right before you go to bed. You can also make extra copies and hang them on your mirror and fridge to give you more encouragement. You can TOTALLY reach your weight loss goals. You just need a SMART goal and the determination and commitment to see it through. Are you Interested in losing weight and looking for a qualified coach with a system that will get you there? If so, I encourage you to book a free 45 minute discovery session with me. We'll chat about your goals and see if my 12 week mind-body boot camp weight loss system is the right fit for you. If I left things to chance, I would rarely exercise or cook meals at home. ​One of the most important things you can do for your health is to plan ahead. It really is the key to successful weight loss and more importantly – long-term weight management! Today I’m going to share some simple tips on how you can get better at scheduling exercise and planning your meals in advance. You know the saying “When you fail to plan, you plan to fail,” right? Well that statement is bang on when it comes to leading a healthy lifestyle. It does take effort, but the more you do it, the more efficient you become in time. First, you need to look at the week ahead and pick the times you will dedicate to exercise because if you don’t plan for it – it won’t happen. That’s just the way it goes. Some people can fly through life by the seat of their pants, but they’re the exception. The rest of us need a PLAN so we don’t get side tracked by the million other things we need to do. Sunday is a great planning day. Sit down with your calendar and pick the days and times you are going to dedicate to exercise and mark it in your calendar. If you have a family calendar, mark it down there too so everyone knows you aren’t available (this is a MUST for all you moms out there). Don’t let others dictate your entire schedule – you need time for yourself too. Also, avoid planning exercise on days that are already full of activities; it will only make you feel stressed and guilty when these activities take longer than they should (and they always do, right?). I also recommend choosing a specific day and time throughout the week. “Consistency breeds success” and creating a routine is a simple way to build new habits. 1. What days and times can I dedicate to exercise this week? 2. Can I schedule 20-30 minutes of physical activity at least 3 times this week? Make it a priority and add it to your calendar with all the other important appointments so you don’t forget. BONUS TIP: The night before, place your workout clothes somewhere visible and leave your shoes by the door (the less excuses you have, the better). If you find yourself wondering what’s for dinner and it’s 5:00 pm, you’re in trouble. It happens to all of us, believe me I’m not perfect either, but when you leave things to chance you are much more likely to reach for quick and easy processed foods. Planning meals in advance takes time to get used to it, but it’s way less stressful and a whole lot healthier in the long run! What are the benefits of planning meals ahead? By dedicating 1-2 days a week to meal planning and prep, you’ll save yourself a ton of time the rest of the week because all your food will be washed, chopped, and ready to go. Plus, when you cook meals at home, you can make double or triple the batch leaving you with lunch and dinner options throughout the week. Before I started planning my meals in advance, I wasted a TON of food (and subsequently money). If you find yourself throwing away spoiled produce or expired food at the end of the week – you need to start going to the grocery store with a plan. Only buy 3-4 days’ worth of food at a time and only buy what you need. Do this for 30 days and you’ll be surprised how much money you save. When you have healthy, pre-made food at your fingertips, you are less likely to rush out and buy quick, convenient, highly-processed food. You also won’t eat “chips and dip” for dinner because your starving and that’s the easiest thing to grab. Being intentional is key to your success and having food “ready-to-go” means you have one less hurdle to overcome. Personally, I plan and prepare my food on Sunday afternoons and Wednesday evenings. While it may seem like a lot of extra work, spending a few hours 2 days a week makes eating the other 5 days super quick and easy. Do you want to see how you can prepare food for the week in as little as an hour? Need a quick and easy meal idea to get you started? No problem. Learning to plan ahead and be prepared is the first habit I teach my clients because it guarantees they maintain their weight loss FOR GOOD. If you want more weight loss tips, enter your name and email address in the fields before so you can start receiving my weekly newsletter TODAY. product discounts, and free giveaways! How to get yourself to exercise! ​​Have you ever noticed how much easier it is to be active when you're caught up doing something that’s fun and has a clear purpose? That's because time really does fly by when you're having fun! 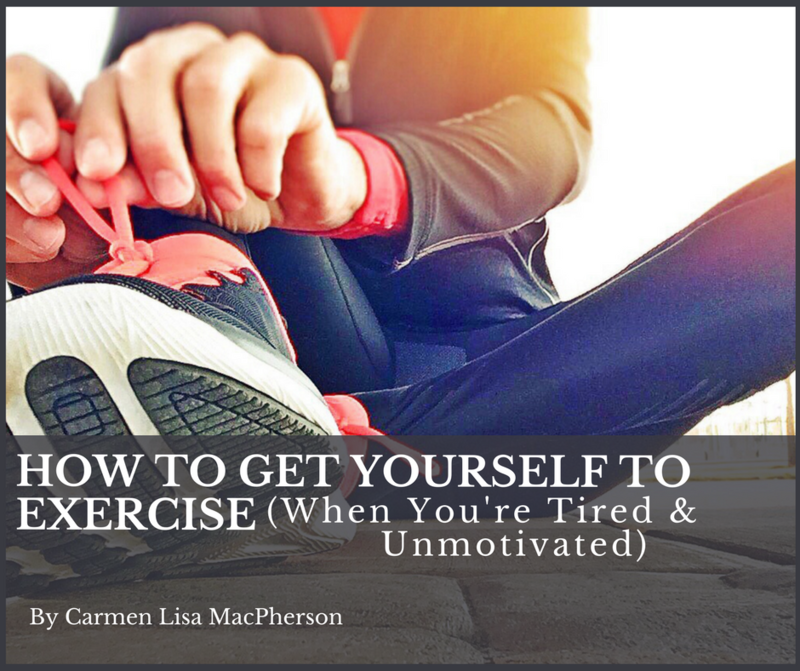 ​So how do you get yourself to exercise when you're feeling tired and unmotivated? Easy. You make it fun! ​Below you'll find 3 ways to transform exercise into something you look forward to - rather than dread. Whenever possible, it’s best to work out with someone else – especially someone whose company you enjoy. Being with another person keeps your mind focused on them rather than the task at hand, ultimately making the work-out pass by more quickly. It also gives you a ton of mood-boosting benefits that come along with social support. Research suggests that exercising with others may be even more effective in fighting depression than working out alone. So, the next time you’re planning a brisk walk, consider inviting a friend or a loved one to join you. Sometimes, it’s not possible to exercise with someone else, but there are other ways to make your workout more enjoyable. Listen to an audiobook – listening to a good book or your favourite podcast is a great way to pass the time when exercising. Have you ever been so caught up in a book that you didn’t realize how late the time was? I certainly have, and the same thing happens when you pair it with exercise. In fact, often times my workouts are even longer because I don’t want to stop before the chapter ends! Pick a game – any exercise that has a game-like quality will capture your attention and be more engaging than an individual activity. Sports like baseball, soccer, tennis, ultimate Frisbee, and volleyball require very little equipment and are super fun to play. There are also several active video games on the market that provide surprisingly good aerobic workouts – have you ever tried Dance Dance Revolution? After 30-minutes, you’ll be sweating for sure! Exercise is WAY easier and more enjoyable when it incorporates a purpose. So the next time you go for a walk or run, try picking a destination that matters to you. It could be a friend’s house, a retail store, a coffee shop or a scenic waterfall – any place at all, as long as it’s somewhere you want to go. You can also create purposeful exercise right in your own back yard, by mowing the lawn, raking, shoveling, mulching, or gardening. Because yard work is so goal-oriented, many people find it highly energizing – which allows them to stay at it for longer stretches of time. And believe it or not, this sort of activity is very aerobic (You can test this by taking your pulse the next time you’re working in the yard). If you haven't been able to stick with a traditional workout program, try one of the strategies above and let me know how it goes. I also want to remind my readers that you don't need to adopt a "typically work-out routine" to lose weight and feel great. Don't forget that while exercising has many benefits for mood, muscles, sleep, and energy, weight loss really is 80% diet! If you've been struggling with you're weight and HATE exercising, I suggest scheduling a free wellness consultation with yours truly. I have a 12 week weight loss program that is AMAZINGLY effective and you'll never have to step into a gym once. I promise! 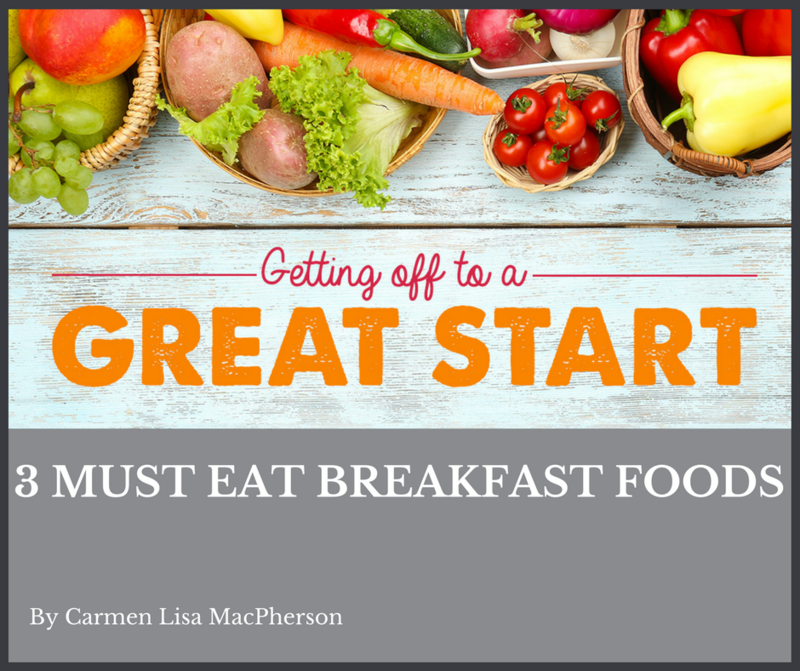 3 Must Eat Breakfast Foods! Do you love your breakfast or skip it? Do you have a list of “go-to” recipes or do you need a bit of inspiration to start eating breakfast again? One thing to remember is that including protein and healthy fat with each meal helps manage blood sugar, metabolism and even encourages weight loss. This is because protein and fat help you feel full longer and your body actually needs to burn more calories in order to absorb and metabolize them. In this post, I'm going to show you how to get protein, healthy fats and even some veggies into your morning routine so you can start the day off right. I’m pretty sure these will become your new “go-to” breakfasts. Egg whites are mostly protein, but the yolks are the real nutritional powerhouses. Yolks contain vitamins, minerals, antioxidants, and healthy fats. Studies show that eggs keep you feeling full longer and also help stabilize blood sugar and insulin. 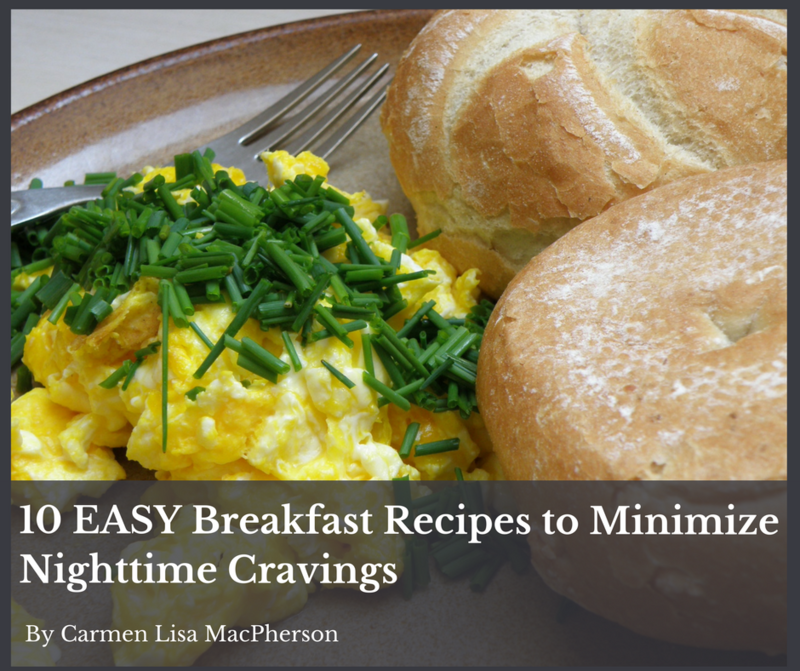 Not to mention how easy it is to boil a bunch of eggs and keep them in the fridge for a quick “grab and go” breakfast when you're running short on time. And no..... the cholesterol in eggs is not associated with an increased risk of arterial or heart diseases. Just be careful not to cook the eggs over high heat. High cooking temperatures can cause the cholesterol to become oxidized and it’s “oxidized cholesterol” that's unhealthy for the heart. If you stick to low-medium heat when you are cooking eggs over the stove, you’ll be A-OK. Nuts and seeds contain protein, healthy fats, vitamins, minerals, and fiber so they make a great addition to any breakfast. Just don’t reach for “candied” nuts, sweetened nut/seed butters, or chia “cereals” with added sugars. I'm talking about real, whole, unsweetened food here. Nuts and seeds are the ultimate fast food if you're running late in the mornings. Grab a small handful of almonds, walnuts, or pumpkin seeds along with your boiled egg and you can munch away during your morning commute or once you reach the office. Not to mention how easy it is to add a spoonful of nut/seed butter into your morning breakfast smoothie. You can get your hands on 9 delicious smoothie recipes by signing up for my FREE 48-Hour Smoothie Challenge. If you like creamy lattes in the mornings, try making one with nut or seed butter. Just add 1-2 tablespoons of creamy nut/seed butter to your regular hot tea and blend until frothy. You probably already know that protein is important for every meal; but what about vegetables? Veggies are powerhouses full of vitamins, minerals, antioxidants, phytochemicals, fiber, and water. You can't go wrong adding them to every single meal so try adding them to your breakfast too! You can even try having a salad or roasted veggies for breakfast! It might seem strange at first, but there’s no reason why you can’t step outside the box little. Personally, I love raw veggies like broccoli and carrots with a little bit of dip first thing in the morning. I've included a delicious recipe below that includes protein, fat and even veggies for you to try. 1. 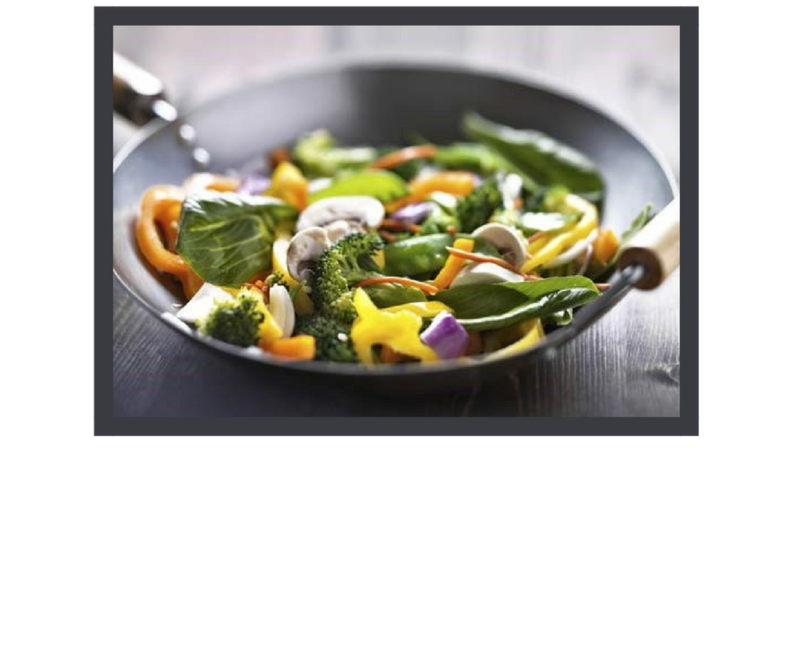 Add coconut oil to a frying pan and melt on low-medium heat (cast-iron pans are preferred). 2. In the meantime grab a bowl and beat the egg(s) with your vegetables of choice and the spices. 3. Tilt pan to ensure the bottom is covered with the melted oil. Pour egg mixture into pan and lightly fry the eggs without stirring. 4. When the bottom is lightly done flip over in one side and cook until white is no longer runny. 5. Serve with a slice of whole wheat toast & enjoy! Veggie Tip: Substitute with your favourite vegetables. Try grated carrots, chopped broccoli, diced tomato, and onion. Vegan Tip: Substitute eggs for tofu to make "Veggie Tofu Scrambled" instead. What if instead of seeing "enemies", we learned to recognize ourselves in others? ​What would the world feel like if we decided to replace our fear and prejudice with love and compassion? What would the world look like if we stopped pointing the finger outward and instead, turned it inward? ​What if we all became a little more interested in being the best versions of ourselves, instead of focusing on how others could be better? What if every day our mantra was: "How can "I" do better?" ​What would the world look like then? Some may say this kind of thinking if "idealistic", but from what I know about the human heart, I know it is entirely possible. We are not the destructive, violent, uncompassionate species that media makes us out to be. The acts of violence we see around us in the world isn't us - its "fear in motion". We've all been made to live in fear and we've all been forced to react to this false sense of "being under attack" ALL THE TIME. But are we? Are people really out to "get us?" Most people I meet just want to live their life in peace and comfort. They want a life of meaning, purpose and fulfilment. They want food, shelter and friendship. They want to experience beauty, wonder and grace. Most people don't want to fight - they just want to live. I mean, Isn't that what you and I want? So who are we fighting really? Who's the big bad enemy? The Americans? I know a LOT of American's and the are awesome, smart and kind. The Muslims? I know a LOT of Muslim's and they are awesome, smart and kind. The Immigrants? I know a LOT of immigrants and they are awesome, smart and kind. I could go on and on - but the answer will always be the same. In the end, I think we're all awesome. But we can't ALL be awesome, right? I mean, if we're all awesome, then who are we fighting? ​That's a great question and I have many theories (but those are for another day). 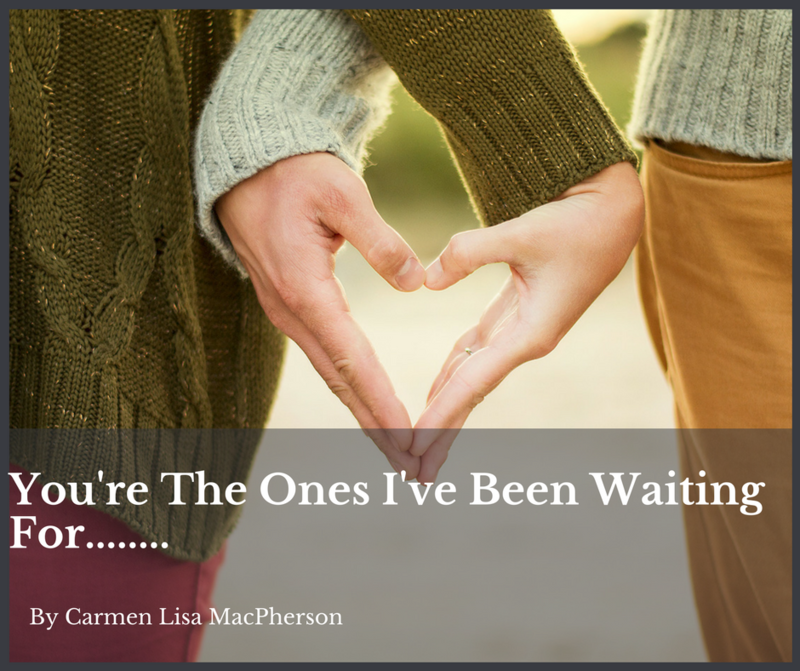 ​Today I just want to talk about us, you and me, and how very similar we are when you focus on what really matters - that we are Love incarnated. Yes, we (you, me, them) are love. The spirit inside you is pure, loving, kindness. Believe me when I say this - you are good and the very essence of you, is in fact, love. But how do we become reunited again? How do we unite together as one super human AWESOME race that says, "you know what? I'm Done Living In Fear. I choose Love." Well........I think we just​ decide. ​We decide that we won't let fear rule us anymore. We decide that the path of least resistance doesn't serve us anymore and we commit to not only finding the essence of Love within, but we commit to sharing that Love with everyone and anyone that crosses our path - yes, even the ones who scare us! Even the ones who do terrible, ugly, ungodly things. Even the ones we "GASP" currently hate. ​Because that's what loved ones do. When someone we know is lost we rally up the troops and we go out and find them! Because they CAN be found - and not with threats, violence and war - but with LOVE. ​We choose love. Because THAT is who we really are. "I'm done fighting. I choose you." ​And how do we do that? P.S I know letting go of fear it hard. I struggled with it my whole life, but I refuse to be a slave to it any longer. If you want to learn how I let go of my fear, you can read my story here: How I Let Go of Fear. My mission in life is to share my simple philosophy for better health and greater happiness. Eat to Live. Live to Love. Food is the gift that nourishes our mind and body. Love it the gift that nourishes our soul. Together, they equal the recipe that will take your mind, body and spirit to the next level. THIS SITE OFFERS HEALTH AND WELLNESS INFORMATION AND IS PROVIDED FOR EDUCATIONAL PURPOSES ONLY. IT IS NOT INTENDED TO DIAGNOSE, TREAT, CURE OR PREVENT ANY DISEASE AND YOU SHOULD NOT RELY ON THIS INFORMATION AS A SUBSTITUTE FOR PROFESSIONAL MEDICAL CARE OR ADVICE. CONSULT YOUR DOCTOR ABOUT MAKING DIET, EXERCISE AND LIFESTYLE CHANGES THAT ARE RIGHT FOR YOU. Copyright 2017 - Carmen Lisa MacPherson - All rights reserved.